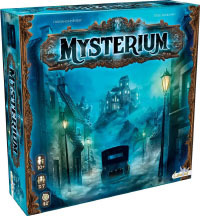 One player chooses to be the ghost and the other players are psychics. The ghost may choose to play the game without uttering a single word; eg, he might confirm the psychics' intuitions by knocking on the table: one knock for yes, 2 knocks for no. Place the clock on the table with the hour hand set to I (the 1st hour). The space in front of the clock is the clairvoyance token discard area. Set up the progress boards as shown in the rules (starting from the psychics' end of the table: the character, location, object, and epilogue boards). 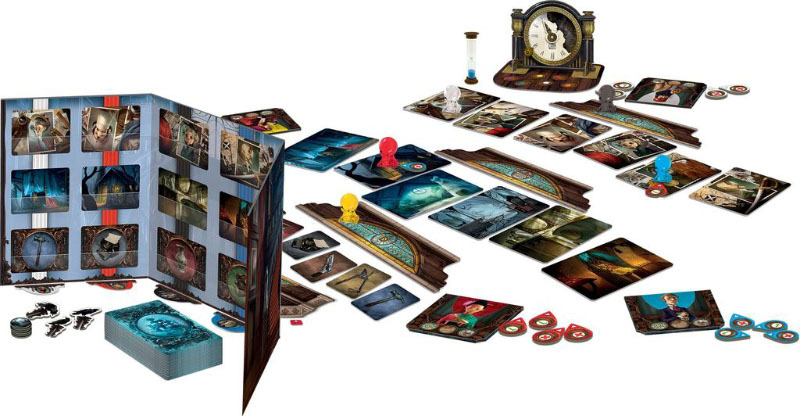 Place the clairvoyancy track around the epilogue progress board, with the side faceup that corresponds to the number of players. The ghost places the screen in front of him. Each column corresponds to a different psychic, and each row corresponds to a type of ghost card: character, location, and object. The ghost takes the number of crow markers corresponding to the chosen difficulty level. Shuffle the character psychic cards and draw (facedown) the number shown above. Look through the character ghost cards and select the ones whose numbers match the drawn character psychic cards; pass these to the ghost. Place the character psychic cards faceup next to the character progress board. The ghost shuffles the received character ghost cards and draws as many cards as there are psychics in the game. He places these in the character spaces on the inside of the screen, in the columns representing the colours of the various psychics. Return any remaining cards to the box without looking at them. Repeat these steps for the location cards and then the object cards, placing the drawn psychic cards next to the appropriate progress boards, and the ghost cards in the appropriate spaces on the inside of the screen. This generates a combination of 3 cards (character, location and object) for each psychic. The ghost takes 6 culprit tokens, 3 crow markers, and the ghost tokens corresponding to the psychcs in the game. Place the ghost tokens behind the screen, coloured side up, at the bottom of the appropriate columns. Place the vision deck behind the screen. The ghost starts the game by drawing a hand of 7 cards from the vision deck. The psychics attempt to identify, in order, which characters are crime suspects, where the deed might have been committed, and what objects might have served as the murder weapon. Each psychic moves their intuition token along the 4 progress boards to visually represent their progress. At the start of the first turn, place the psychics' intuition tokens on the character progress board. The ghost's task is now to help the psychics to guess the character card assigned to them behind the screen. He does this by projecting a vision to each psychic, consisting of one or more vision cards. Picks another psychic and repeats the same procedure until all psychics have received at least one vision card. Upon receiving a vision, each psychic attempts to interpret it and discover the character/location/object to which it refers (depending which progress board their intuition token is currently on). Psychics may freely examine their vision cards and psychic cards, and discuss hypotheses with the other psychics. When the ghost has projected visions to all psychics, he starts the sand timer. Before the sand timer runs out, each psychic must place his intuition token on the psychic card to which he believes the ghost is guiding him. The other psychics may help with decision-making by analyzing cards and giving their opinions. Psychics may change the positions of their intuition tokens at any time until the sand timer expires. Several psychics may place their intuition token on the same psychic card; however, as each psychic has to find a unique combination (character, location and object), at least one of those psychics must be wrong. Although the ghost may listen to discussions between psychics, he should never make comments or gestures that could serve as clues. At any point in the game (including during the Revealing the Culprit phase), the ghost may discard any or all of his vision cards and draw new cards to bring his hand to 7 cards (subject to the limit on the number of discard operations determined by the difficulty level). Place a crow marker on the screen every time these option is taken to keep track. At any time until the sand timer expires, players may add or remove clairvoyancy tokens to the intuition tokens played by the other psychic. These tokens enable psychics to progress on the clairvoyancy track, potentially unlocking extra clues when attempting to identify the culprit in the final phase of the game. There are 2 types of clairvoyancy tokens: tokens with the icon, indicating that the player agrees with the psychic's intuition, and those with the X icon, indicating the opposite. A psychic may not play more than 1 clairvoyancy token per intuition token or add a clairvoyancy token to his own intuition token. A psychic may play as many clairvoyancy tokens as he wants during a turn, but is not obliged to use any at all. As multiple intuition tokens may be placed on the same psychic card, each clairvoyancy token should clearly point to the token with which it is associated. After use, all clairvoyancy tokens must be discarded to the space on the clock board, to be retrieved at the start of the fourth game turn. The ghost manifests itself to let the psychics know whether or not they have correctly interpreted their visions. The ghost may reveal this information in any order he pleases. He informs each psychic that his intuition was correct (if the psychic's token was placed on the right card) or incorrect (if the token was not placed on the correct card). After manifesting to a psychic, the ghost moves the ghost token of the corresponding colour away from the screen. The ghost flips the corresponding ghost card in the screen. Any psychics who played a clairvoyancy token move their markers forward 1 space on the clairvoyancy track. The psychic collects the correct psychic card and slides it into his sleeve, discards all his vision cards, then takes his intuition token and places it on the next progress board. Any psychics who played a clairvoyancy token move their marker forward 1 space on the clairvoyancy track. The psychic returns his intuition token to the same progress board from which it was taken, and retains his vision cards in front of him. In each subsequent turn, the ghost will provide 1 or more additional cards to enhance the vision, until either the correct psychic card is picked or the game ends. When a psychic has successfully identified his combination of psychic cards, he places his intuition token on the mission accomplished space on the epilogue progress board. He then moves his marker forward 1 space on the clairvoyancy track for each hour remaining on the clock. Thereafter, he continues to take part by helping the other psychics to interpret their visions, and may still play any remaining clairvoyancy tokens. At the end of this step, move the hour hand forward 1 hour on the clock. The psychics' intuition tokens may be located on different progress boards. If one or more psychics have not yet identified their character, location and object, a new Reconstruction of Events phase begins. If the clock was already showing the VII (the 7th hour), the game ends and all players lose. If all the psychics have successfully identified their character, location and object combinations, move on to Phase 2: Revealing the Culprit. This phase only takes place if all the psychics have successfully identified their character, location and object combinations before the clock strikes VIII. The psychics arrange their combinations of cards into groups, in order to compare the suspects and enable the ghost to identify the culprit. Collect any psychic cards that were not placed in sleeves and return them to the box, together with the character, location and object progress boards. The psychics collect all of their clairvoyancy tokens. Place 1 ghost token per psychic in the centre of the table, numbered side up. Return the unused ghost tokens to the box. The psychics remove their combinations of 3 cards from their sleeves and associate them with the numbered tokens, forming several groups of cards in the center of the table, each containing 1 suspect. The ghost attempts to guide the psychics towards the group of cards in the middle of the table that contains the culprit. The ghost picks 3 vision cards from his hand. These cards form a shared vision and must all point to the same group. 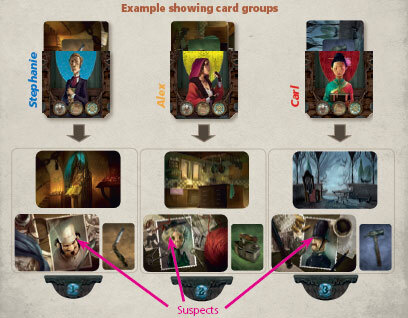 One of the cards must point to the character in the target group, another to the location, and one to the object. The ghost then shuffles the shared vision cards and places them facedown in the middle of the table. This is the culprit's group. The ghost secretly takes the culprit token with the number matching that group and places it facedown in the culprit space on the epilogue progress board. The psychics hold a majority vote to pick the group containing the suspected culprit. The ghost must not indicate which card in the shared vision relates to which element of the combination. The psychics vote in secret, and cannot communicate with each other during the procedure. Psychics vote at different times, depending on their clairvoyancy level, as determined by the position of their clairvoyancy level marker on the clairvoyancy track. Psychics with an high clairvoyancy level will see all 3 cards. 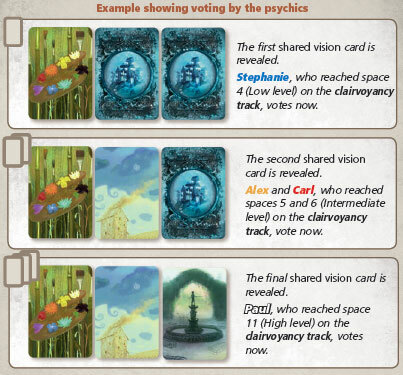 Psychics vote using the numbered sides of their clairvoyancy tokens. Each psychic takes the token bearing the number of the group that he thinks contains the culprit and slides it into his sleeve. When all psychics have voted, the votes are revealed. Pass all the sleeves to the psychic with the highest score on the clairvoyancy track (on a tie, to the eldest of the tied players). This player reveals each clairvoyancy token in turn, placing it on the card group matching the number on the ghost token. If one of the groups has received more votes than the others, it is the suspected culprit's group. If no single group has a clear majority, the tie is broken in favor of the group chosen by the player who progressed furthest along the clairvoyancy track. That group is the suspected culprit's group. If a tie persists, it is broken in favour of the group for which the eldest player voted. Reveal the culprit token placed on the culprit space. 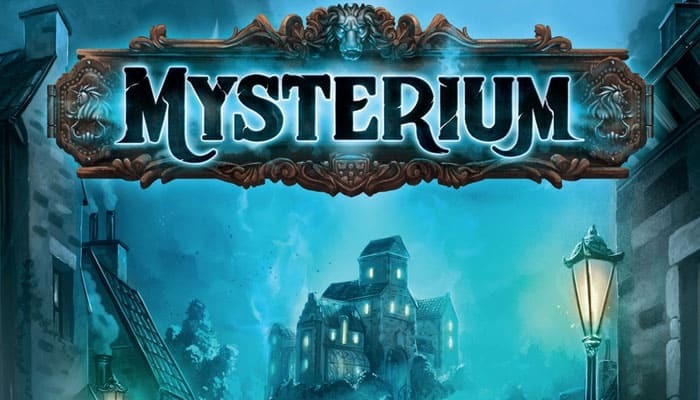 If the group chosen by the psychics contains the true culprit, all players win the game together and the ghost's spirit is laid to rest. Otherwise, the game is lost.